CWEIC recently led a delegation to Vibrant Gujarat 2019 in Ahmadabad, India, with over 70 Commonwealth businesses. After the summit the team traveled to Mumbai for a series of meetings. There, CWEIC Chair Lord Marland was honored to meet the Hon’ble Chief Minister of Maharashtra Devendra Fadnavis. 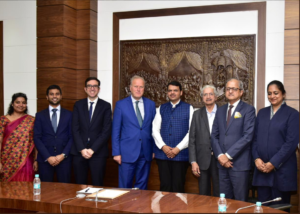 Lord Marland briefed the Honorable Chief Minister on the recently signed MoU between the State of Gujarat and CWEIC, which established a partnership between CWEIC and the State to deliver an SME development programme. This programme is designed to encourage Gujarati SMEs to export to the Commonwealth.